Properly anchored in the waves close to Frederikshavn, the prototype, Tordenskiold, must stand its test and establish that there are oceans of energy to extract from the sea. The wave energy plant from Crestwing, named Tordenskiold, is now anchored in place in its correct element the waves northeast of Hirsholmene at Frederikshavn. Tordenskiold measures 30 x 7,5 m with a weight of 65 tons. “It has taken us 13 years and about 30 million DKK to test ideas and functions in the wave energy plant and to develop this prototype, Tordenskiold”, says a proud director for Crestwing, Ruth Bloom. It was a happy crew Wednesday, December 5, 2018, when the anchor connection was pulled into the wave energy plant, and Tordenskiold was properly secured with the unique three-point anchoring system. “It feels great. I am lucky to be surrounded by competent people who are as passionate about this project as I am. That energy and commitment has made it possible to get this far”, said Ruth Bloom, when she was able to toast in a glass of well-deserved champagne with her closest staff and partners. 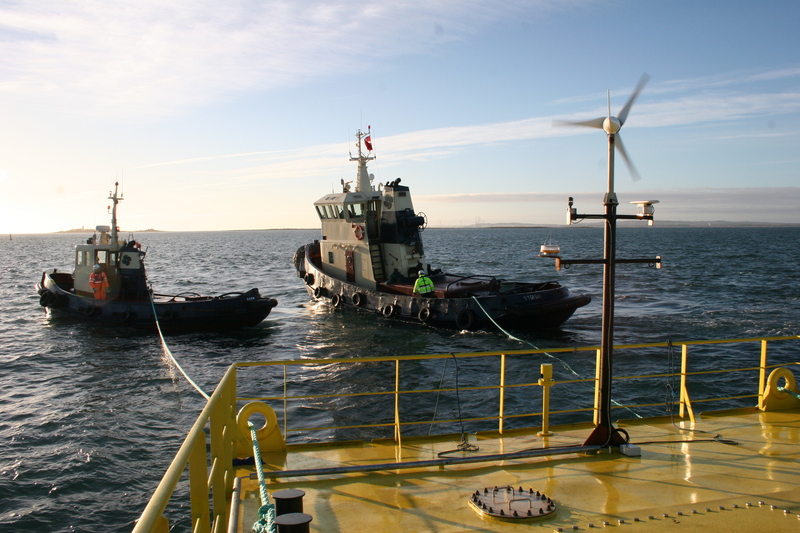 The purpose of Tordenskiold's location at Hirsholmene is to test the plant's anchorage and function at sea and confirm the expected production of energy. Focus in the two-year test period is to test the anchoring system in wave categories from small waves to storm and hurricane, as it has been one of the biggest challenges for many wave power concepts in the world. In addition to this, the Power Take Off system and hinges will be further developed. “Crestwing is in no way similar to other wave energy plants and utilizes the energy of the waves in a unique way as the plant mainly utilizes atmospheric pressure for the production of energy”, Ruth Bloom explains. She knows for a fact that Crestwing has solved the biggest challenges of wave energy: 1) The high costs producing the plants, 2) The low power generation and 3) The challenges of accidents. "We are looking forward to establish that wave energy can be a significant player in the market of renewable energy," Ruth Bloom says and explains that it has cost Crestwing about 30 million DKK to produce a plant in a form that can easily be scaled up and produced, when the crucial test at sea shows the expected positive result. "This indicates that Crestwing can produce plants and energy at a kWh price, which corresponds to the production of other renewable energy types”, Ruth Bloom concludes. It is easy to carry out service and maintenance on Crestwing as you board the plant as a ship. The Power Take Off system is mechanical and converts about 90 percent of the absorbed energy into electricity. Crestwing has developed a unique anchoring system that minimizes environmental impact on the ocean and the seabed.